A new or remodeled home is exciting. Often times you are able to select the tile or stone used in your home and once construction is complete and contractors the have gone, it should be ready to unpack and live maintenance free for some time, right? Well, maybe so and maybe not. There are things you can do after the dust settles that can make a big difference on how long your hard surfaces remain clean and new looking. 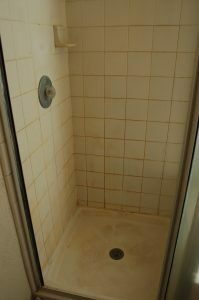 In this post we will discuss ways to protect your showers when new and what can be done once there are unforeseen problems developing. At Beyond Clean Tile, we work with customers on cleaning their hard surfaces as well as helping educate them on proper maintenance. 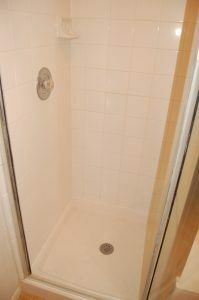 When it comes to showers with tile and grout, I’m often asked about ways to minimize maintenance and how keep it clean. If you have stone or ceramic/porcelain tile and grout in your shower you have porous material. Water is the carrier for dirt, body oils, soaps and minerals that can penetrate into the material. The deposits of these substances remain in the porous surfaces after the water evaporates and makes it hard to clean. The dirt is one thing but the mold and mildew typically create the biggest challenge. Keeping your shower dry is the best solution to minimizing maintenance. Applying a quality silicone caulk and penetrating sealer to your grout and stone when new can save a lot of grief later. If your shower is not new then it may be best to have it professionally cleaned to remove dirt, oils, soap and minerals from the material prior to sealing. You would not want to seal in unwanted material including water so plan on allowing the shower to dry prior to caulking and sealing. Trapping water can reduce the effectiveness of your efforts as well as potentially cause problems later. Our preference is to use a quality impregnating sealer in the grout and stone. In some situations where ceramic tile is used, we may recommend a color seal for the grout. This is a topical sealer for the grout that provides a method of changing the grout color as well as coating the top layer to prevent water from penetrating. Caulk and sealers don’t last forever and will eventually need to be reapplied. How long between applications depends on a number of things. The preparation prior to applying caulk and sealer is very important. Best bonding will come from a clean surface, quality application and using quality products. Avoiding harsh chemicals during regular cleanings will also extend the life of the grout. The best thing you can do to reduce maintenance and keep your shower looking new is to wipe down your shower after each use. This means it should be completely dried after each use. Mineral damage from hard water on the tile, grout and glass can be minimized by simply wiping away the water. Our house uses a squeegee to wipe the walls and glass and a towel to absorb the remaining water. You would be amazed what a difference this simple procedure will make on keeping your shower looking clean. Liquid soap will also help prevent the soapy residue left behind using bar soap. If you have a hand shower head, try using it once a week to wash down the walls. This helps wash away the soap and dirt normally unreachable during a regular shower. 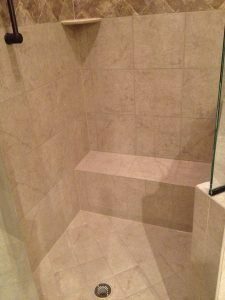 Moving into a new home or remodeling leaves you with a nice new shower. Hopefully this post helps you understand a little more about how to properly maintain it for long term enjoyment. If your shower is new and you would like to make sure it is properly sealed and caulked or if you have a shower you would liked cleaned, sealed and caulked, give us a call. Proper maintenance and restoration is the next step to long term satisfaction.